We took the shuttle down from the quarry. It was already in the 90s - very hot. From there, instead of leaving the park, we drove further in to the Green River valley, the petroglyphs, and the Josie Basset Morris cabin. We used as our guide the 50-cent booklet Tour Of the Tilted Rocks - an auto tour introduction to Dinosaur National Monument . 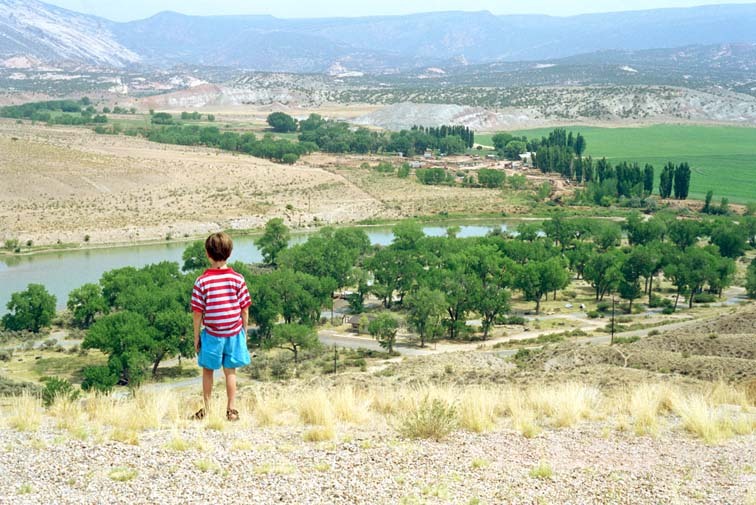 The booklet, published by Dinosaur Nature Association, is available in Vernal at the Northeastern Utah Visitors' Bureau and in a box by the side of the road at Dinosaur National Monument, just after the western entrance. This is a working ranch next to the National Monument. Thomas could see a bulldozer below, near the river bank. 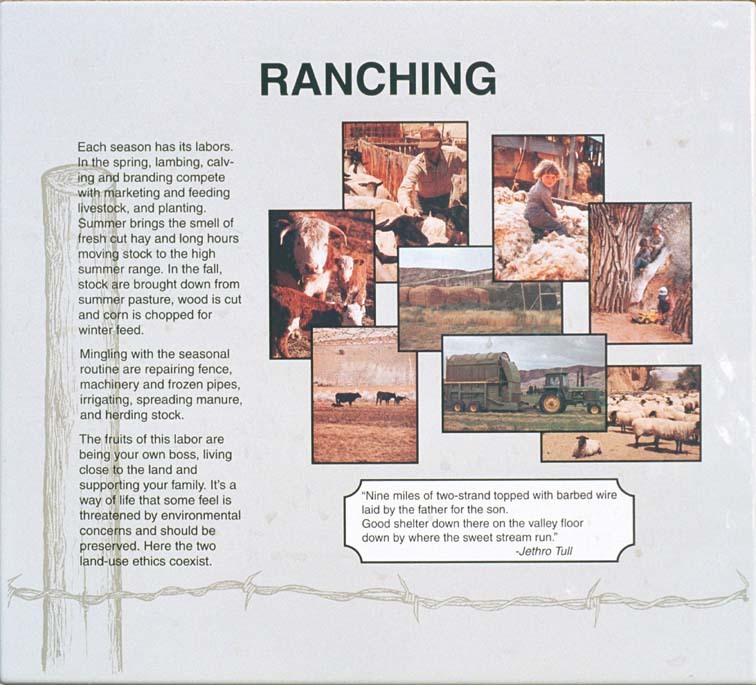 This sign, at the roadside overlook, gives an overview of ranching in northern Colorado. 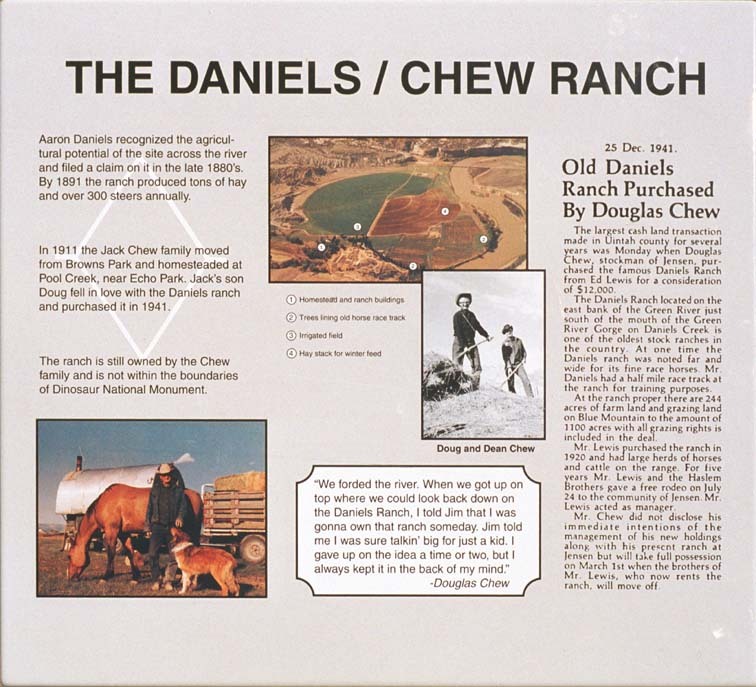 This sign, at the roadside overlook, gives a history of this ranch and the families who have owned it. The river makes all the difference - next to it and irrigated, the ground is green; away from the river or not irrigated, the ground is brown. Scroll to the right with your browser window to see the panorama.